Only 4 ingredients! Great way to use up leftover holiday ham. Ready in under 30 minutes. 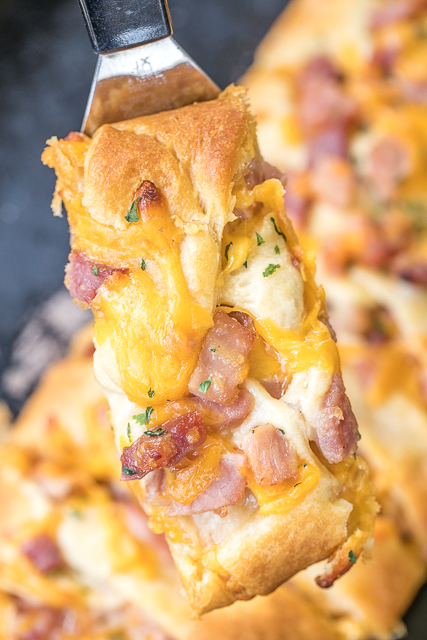 Everyone LOVES this easy stuffed bread recipe!! When there is a Honey Baked Ham in the house I feel like " The Old Man" from A Christmas Story. I just can't keep my hands off of it! It was so hard to chop up all the ham tonight and not eat it all! This braid is really easy to make and tastes great. It is like a hot ham and cheese sandwich - only better! If you have any leftover filling, just spread it onto of the braid. It will make it look pretty and you get more ham and cheese to eat. We had some leftover braid that I am going to eat for lunch tomorrow. Can't wait. This easy recipe is SO stinkin good!! 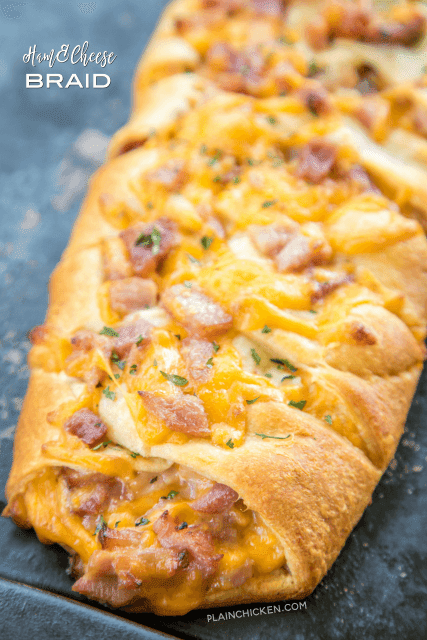 Ham & Cheese Braid - only 4 ingredients! Great way to use up leftover holiday ham. Ready in under 30 minutes. 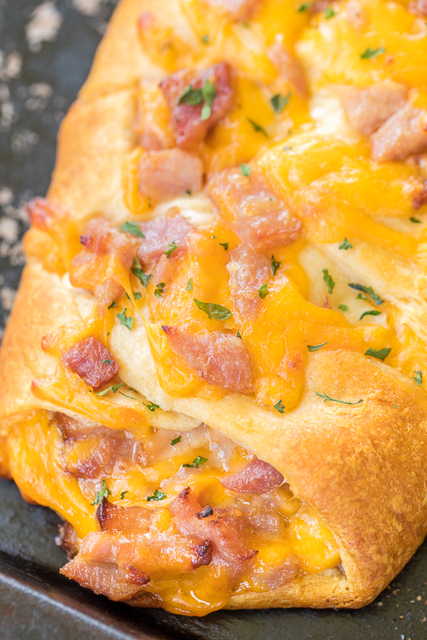 Everyone LOVES this easy stuffed bread recipe!! Roll out crescent rolls vertically on baking sheet, do not separate and seal perforations. Mix ham, cheese and mustard. 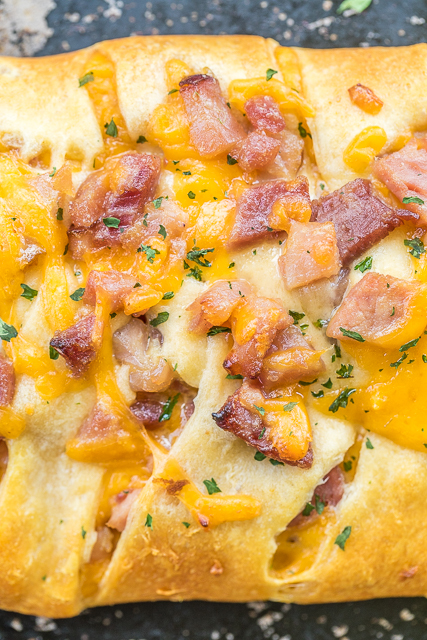 Spread ham down center of crescent rolls. Cut 10 strips on each side of the dough. To braid, lift strips of dough across mixture to meet in center, twisting each strip on turn. Continue alternating strips to form a braid. Bake for 20-25 minutes - until lightly browned. wonder if this would work with ranch? I don't see why not! Isn't everything better with ranch?! So how did the ranch version turn out? My son doesn't like honey mustard so I need an alternate. This looks so good - I HAVE to make it! i just kept the honey mustard out and made it without it and then used the ranch to dip into it...my kids like to dip. lol turned out awesome!!! This was a winner at our house. I need to tweak my oven a bit to get the bottom to crisp up, but we'll definitely have this again! YUM! So festive looking, too! Happy New Year Stephanie!!! I think I will try it with a sheet of puff pastry instead of crescent dough. as long as it tasted good, that is all that matters! This will be for dinner tonight. Looks good! Thinking of adding swiss! We don't care for honey mustard either...so we used pesto on the first one and Dijon mustard on the second one.